I’ve spent a good chunk of the past week trying to drum up support for AirQue st, including our first official playtests in Fresno and a trip to University of Washington for the Research/Design videogame studies colloquium. Thanks especially to Donald Brinkman, the Research Program Manager for Games for Learning, Humanities, and Heritage at Microsoft, and Fresno High School teacher Karl Kaku and his students! 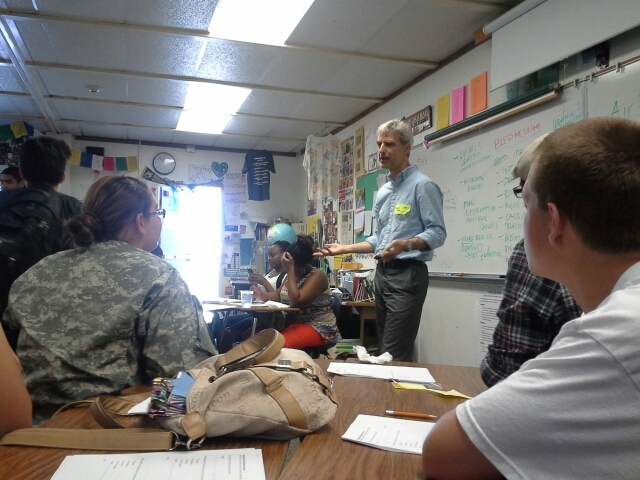 Here’s a picture of Greg (Niemeyer) explaining our co-design process to the Fresno High students. It’s not often that someone from a primarily humanities background finds herself suddenly immersed in genuine data and design, but I’ve been spending hours in Google Form/Docs and PowerPoint designing pre- and post-game player surveys, collecting, processing, and representing the feedback data, and even drawing a new flowchart for our game design. Coming from a world where every word is carefully weighed for nuance, there’s a certain satisfaction in generating pie charts and bar graphs for yes/no answers and measurements given on scales of 1 to 10, or using icons and pointy arrows to connect neatly encapsulated domains. The Keywords for Video Game Studies graduate interest group (GIG) at the University of Washington invites game scholars, artists, designers, developers, and enthusiasts to participate in our one-day colloquium on critical gaming. The colloquium, broadly themed by the keywords “research/design,” is the capstone event to our year-long series of workshop sessions on “democracy,” “time,” “altplay/fandom,” “gold farming,” and “hack/customization” and hopes to provide a space for individuals and groups to present their work, to discuss and collaborate on what it means to study or make digital games, to network, and to play games.